A few quick photos from the Amish settlement in Charlotte County, Virginia. This is a small community of just one church district. Amish here drive Lancaster County grey buggies. Have been having a great visit (am currently in Lancaster County, and visiting PA Dutch markets around Philadelphia today), though internet is pretty scarce! 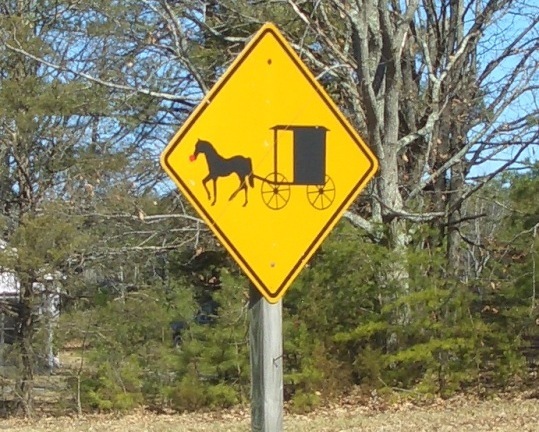 A Virginia Amish buggy sign. No word if “Rudolph” is a popular name for horses in this community. In the winter months Amish produce farmers start their plants off in greenhouses like this one. Dairy farming and sawmills are common among Amish in Charlotte County, VA.
An Amish phone shanty at the end of a lane. I haven’t found a phone shanty with wi-fi yet, so had to use Barnes and Noble’s to be able to post this–although I should say I did just charge my cell phone on my host’s sons’ “clandestine” cell phone charging station in a tiny basement closet! Wow, a “clandestine” cell phone charging station hid in the basement closet!! Is this signs that perhaps the Amish are wanting to modernize a bit more and going against the ordnung? I wonder what the church would do if he were to get caught with that? Have a good day and be safe on your travels!! Some thoughts connected to your post and photos of the VA Amish. 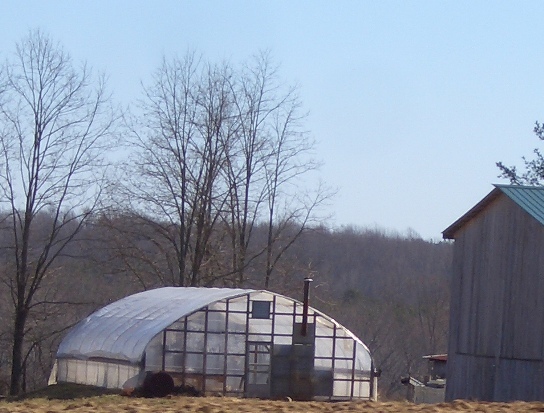 This Amish Virginia greenhouse photo is nice. Would be curious what type of things the Amish start there and when they plant them. I know in my wife’s family farm they have talked about using a greenhouse, but where we are the weather is a bit colder and not as optimal as VA. If you look close enough at the Amish buggy photo you have, I almost think I see a low wi-fi zone sign in the background. I wonder since the Amish use so little technology including wi-fi and cell phones, if in ten years there will be a low noted difference in health problems caused by less EMF? Anyway sorry for rambling, I hope you have a nice trip among the Virgina Amish. I didn’t realize that there were Amish in Virginia though aware of many Mennonites in the Harrisonburg area (Eastern Mennonite University)as well as here in the Virginia Beach/Chesapeake area. When did the Amish settle in Charlotte County? And by the way, you are in and near one of my favorite parts of the country today … Lancaster County … heaven on earth! Be sure to pick up a soft pretzel at Miller’s Twist and say “Hi” to Roger. Roger is the owner and has the best soft pretzels. If you tell him you know his Mom he will very likely give you a free pretzel. He is at the Reading Terminal Market. Enjoy your day! I had no idea about Amish in Charlotte County. My 93 year old mother in law was from there. She a middle child of 11 is the last of the surviving children. We go there occasionally for funerals. I’ll have to contact a few of the cousins who still live there. I knew there were a lot of Mennonites around Stuarts Draft and also here on the eat cost where I live but none here are Buggy Mennonites. Elaine, you must live in my areas, Va. Beach/Chesapeake? I’d say our Mennonites are rather “progressive” … miss Yoder and Bergey Dairies though love going out to Bergey’s Bread Basket on Mt. Pleasant Rd. So glad I can get my “Amish” noodles and pancake mixes from them. We took home delivery from Yoder’s for years. Sometimes the Amish are allowed to have cell phones; especially if they use them through their businesses. Too funny; a clandestine cell phone charger. What was the electricity source for it? Looks like you are having a good time, Erik. Enjoy and be safe! Great pictures. I love the houses some Amish live in, ever so, well, traditional and modest looking. I would guess that the one pictured this time is multi-use, aside from a residence. Does anyone ever see outhouses in Amish country? Since I’ve been reading Amish America, it makes sense what I remember from one of my last visits to Ontario Amish/Mennonite country, I remember little shacks by the side of the road in some places, it makes sense now that they were “phone shanties”, I maybe though they were places to go and do one’s business while on the road while riding one’s horse and buggy. From what I’ve heard most Amish now have indoor plumbing in their homes, including running water in their kitchens and yes, bathrooms. You’d probably find some old timers still using backhouses. I’m guessing it would all depend on what their individual communities allow. Most also allow propane stoves and refrigerators. Cell phones can be allowed as long as the user needs it for their business or for health emergency issues. Sounds to me like it won’t be too long before the Amish will have phones in their houses…..just because you have a phone in your house doesn’t mean you have to answer it……and you can turn the ringer down so you don’t have to hear it ring….and you can call people when you want to….when someone calls me and it says UNLISTED NUMBER…. I just ignore that call….and all 800 numbers are ignored too…….if you call me it better say your name and your phone number…..otherwise it will not get answered…..nothing says I have to answer that call…..I pay the phone bill, I will answer when I want to…..it’s just that easy…………………. Oh my goodness Mona it is not just that easy when a person puts God and church beliefs before everything else in life, including phones/cell phones. Which by the way, is what the bible says ALL Christians are to do. The Amish in particular, albeit not perfect, do strive to put God and church first. In such, if the church does not believe phones in the home of any type are good then the Amish are going to adhere to that, or at least try very hard to adhere to it. There will be some exceptions as in any community, however in general terms, they will do what they are suppose to. Now I am sure you do not see why owning a phone would be a problem or how it could lead to problems. You are not Amish nor do you follow their faith so you probably would not understand it. I’m not going to take the time to explain it here, but the bottom line is just because YOU think something is OK and should be no problem with the Amish doesn’t make it so. Agreed I am an ordained Reverend and MOST will never understand we need to put GOD FIRST and all these modern conveniences distract us from God and living a TRULY CHRISTIAN life. Moat put bills first they even tell me “God doesn’t pay the bills” and I tell them you are only alive because of God much less have that job or family you say you work for. WE SHOULD ALL TAKE A LESSON FROM THE AMISH AGREED!!! I wonder where the phone charger gets its power from? Is it one of the solar ones perhaps? What’s interesting is one of my co-workers noted that today 20-somethings (my age bracket) don’t tend to have landlines anymore. Which is true…of my friend group I can only think of one person who does (I certainly don’t). I suppose I see it as an unneccesary expense. Also I like my cell phone as only certain people have my number, and I hardly ever get calls from solicitors. To be honest I hardly ever talk to anyone as well…my friends and I tend to text each other, and the only people I talk to on the phone would be my parents and grandma. 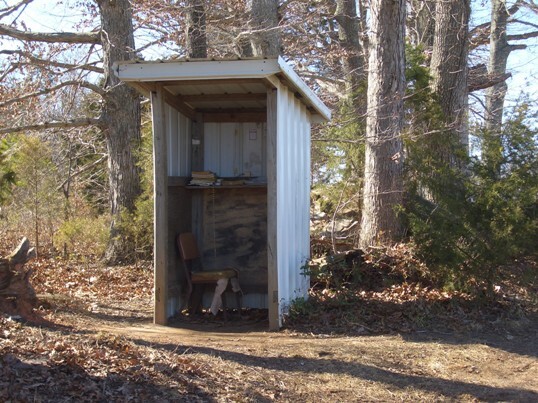 So that leads me to think that perhaps in some Amish groups that allow cell phones they likely have the pre-paid phones that only have X amount of minutes to be used a month…kind of like the phone booth, in which you use it only when you absolutely have to? I love the photos! And Alice (Aber), I’m looking forward to see some photos from Arthur. I think we “English” (or Yankees) should go back to having phone booths to use with our cell phones–I am so tired of listening to one-sided “conversations”, and usually LOUD! Actually, phone shanties would certainly be more “folksy” and “rustic” and I think they’d help limit one’s use of minutes—how long would you like to stay in that shanty!? Mona, I do pretty much the same as you—screen which calls I want to answer and ignore the rest. Although I do understand the Amish rule against them. It wouldn’t take much for me to give up phones, period (although I obviously still use the ‘net! )There’s a LOT to be said for the “simple” life. Lindsay, I think it is true that most of us young folks do not have landlines. It is the same for me and my friends here in Sweden, I do not know a single person whom I am close to who is under 30 and has a landline. All have cell phones and some have skype or other internet solutions for phoning. I have just a cell phone though. Mark that is a good question on EMF. I do not know. On greenhouses, I can say all sorts of things. My friend is doing his tomatoes and lettuce right now. Robin, Elaine, Amish settled Charlotte Co fairly recently, in 1997. Karen, Lindsay the power source was a standard car-type battery run through an inverter (see above comment). Lindsay and that’s a good question on pre-paid, I don’t know how prevalent that would be. Kind of seems to make sense though. Kathy, it was a great trip! Alice Mary–true, I don’t know what else you can do in phone shanty but talk and doodle–no recliner is going to fit in there, anyway. Elin, I’ve found that to be the case too in Poland. Many have cell phones, no land lines. Hi! I will be driving through this area in a few days and would love to be able to drive through their community. Could you give me a physical address that I could put into mapoquest? Wendy these folks are scattered about, but Wards Fork Mill Rd has a few homes. 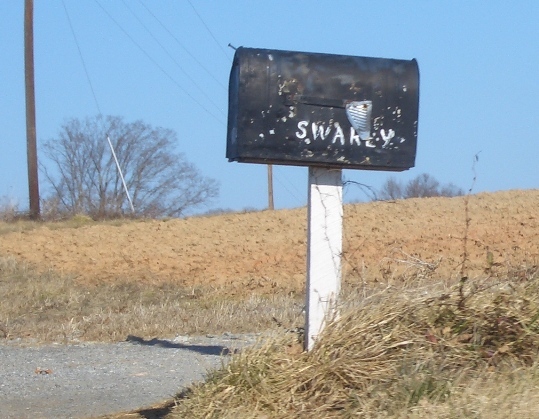 This is also a small community. How would I go about visiting them? Greater article. 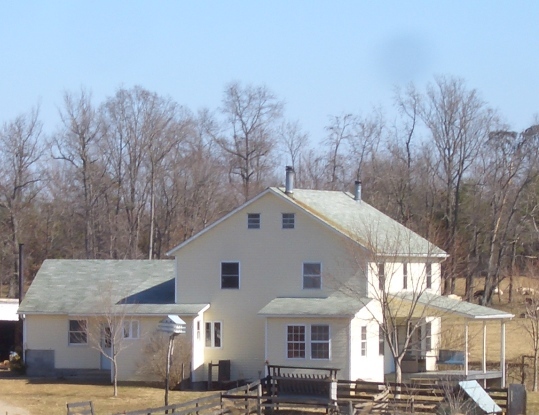 I am in the Farmville va area and I’m starting a self sustainable community nearby. I am going to model a large part of it on the Amish community. I am interested in spending time with them and learning from them as well as selling their products. I am just not exactly sure what the best way to contact them would be. I have spent all day looking for some contact to the Amish community in the area of Blacksburg. I have been told that they do amazing woodwork and would like to see if they can help me in my current endeavor. If anyone can aide me in my mission, either by contact with a local group or local craftsman, please feel free to email me. Thank you very much for your time. Frank, I’m sorry that I only saw this comment now, probably too late to help you. My son joined the Amish in that community and then moved after the church split, but there are some still there and I have a number for the King family you could try. If you need more info let me know. Hope this helps! I live about 15 miles from part of the Charlotte County settlement. I frequently follow their buggies on Highway 47 or Thomas Jefferson Highway. Unlike the impatient englisher, I love to open my window just to hear the ‘clippety-clop’ of the horses. I do worry for their safety as this highway is very busy with logging trucks and is only two lanes. Each year during late February or early March, they have a “Mud Sale”, or Auction which we call it. This is a great time time mingle with the Amish, although most prefer to not ‘mingle’. It a great opportunity to get your fill of Amish food, baked Goods, canned goods, etc. As stated above, it is difficult to single out the Amish farms as most of them are off the road, down long dirt driveways and are scattered throughout the county. Occasionally you can catch a glimpse of the children walking or men working the fields with their horse drawn farm machinery. Forgot to mention in earlier post, there is a Amish Furniture Store in nearby Farmville, Va. ‘Amish Originals’ is run by a local Mennonite family but the furniture is made in Pennsylvania and Ohio. If you’re in the area, this is a great place to shop! There is also an Amish general store on 3rd Street in Farmville; “Miller’s Store” features baked goods and staples needed in every kitchen, as well as fabrics. If you are looking to ‘run into’ the Amish, this is the place to go. Any Amish or Mennonites near Abingdon or Elizabethton,VA? Does anyone know of any Amish or Mennonites near Elizabethton or Abingdon,VA? My uncle lives in Mountain City,TN near the TN/VA state lines and we stay in either Elizabethton or Abingdon,VA when we visit him. It’s about a half hour’s drive from Mountain City,TN with beautiful scenery all year round. Although,winter’s kind of rough on the roads we take. If you do visit there check to see if there are any NASCAR races in Bristol,TN. There will not be an open decently priced hotel within a hundred miles on those weeks or weekends that the races are going on there. I just discovered this post and had to laugh- the Rudolph sign is on the road where we keep our horse! The Amish community here is larger than you think, over 50 families, spread between County Line Road, 47/Germantown and Charlotte Court House. They are very much connected and a part of our community; dear friends and neighbors. There is now a large produce auction created and run by the Amish right at Vincent Store Road and 47- they are open on Tuesdays & Fridays, seasonally. And you can’t visit without stopping by the Esh’s store! Open Friday at 11, Saturday at 10:30, you can find it as the first drive off 47 onto Germantown. Here, the Amish sell milk to large milk trucks, have saw mills, and the new produce auction is drawing people from all over to buy in large quantities. Our Amish neighbors do not use phones, except in the shed to place a call to a trucker for work on the mill or similar use; they do use solar but only to recharge a tractor battery. Their homes usually have air compression to run the washers, etc. They have zero desire to “be” us, but are great, great friends with people who are not Amish too. The last I heard (a few years ago), there is also a small group of Horning Mennonites (from PA) in the Charlotte Court House area. They had no resident minister and “pipe in” church services from Pennsylvania. Interesting to hear that Bill. Sounds like putting technology to good use. I almost stopped in again at the Charlotte County Amish on my way back from PA/OH last month, but decided to go to Halifax County instead. I’ll keep this on the radar as I plan to go back to Virginia soon as well. Made some nice acquaintances at one Amish place in Halifax Co. this time.